A two wing cutter block in hard wearing light metal alloy with easily replaceable TC profile inserts. The block will cut the profile and matching counter profile to produce joints for cabinet doors, panelling etc. in all solid timbers and man-made boards. The replaceable tips ensure consistent cutting performance with no sharpening necessary: simply replace the inserts when they become blunt. The block is supplied with a pair of profile knives fitted; additional knives may be purchased to change the profile. N.B. two knives are required which are priced singly. 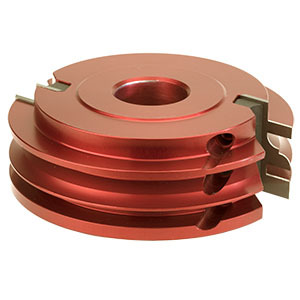 The block is suitable for jointing material from 22mm to 27mm in thickness, has a tongue and groove width of 5mm and a profile width of 12mm. 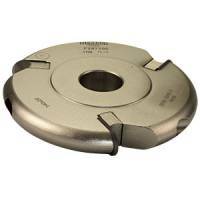 A guide ring 98mm diameter is available to match this block - see Spindle Accessories section. Manufactured to EN847-1/2 - suitable for HAND FEEDING. Spare parts should be selected from the table above and ordered from the Spares and TC knives section.